Nurses are on the front line when it comes to safe medication use and counseling patients. The PDR (R) Nurse's Drug Handbook 2017 provides all nursing professionals, no matter what the clinical setting, with an accurate, up-to-date, and easily accessible guide to the most commonly prescribed drugs. 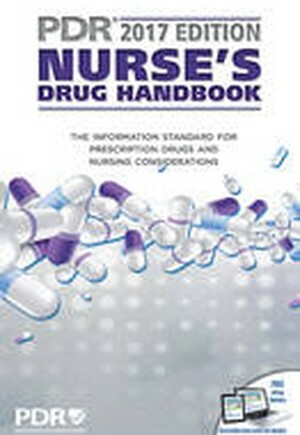 Based on the FDA-approved prescribing information, PDR's staff of pharmacists has developed concise monographs that highlight the most important information on each drug, including its approved use; dosages; interactions with other drugs, food, and alcohol; side effects; safety information; and more.Clear, straightforward nursing considerations provide guidance on proper patient assessment and monitoring, as well as patient counseling and drug administration. In addition, product comparison tables are updated for each edition, with new tables added to reflect the latest information and current practice standards.